Hey All! 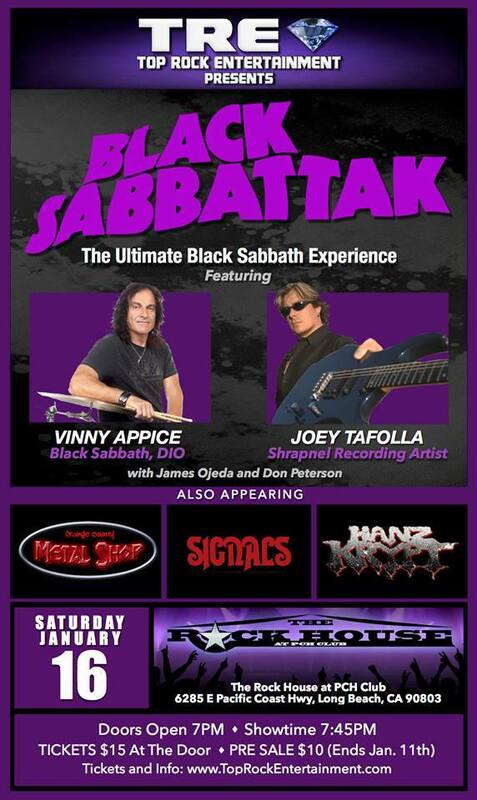 VINNY APPICE and I will be playing with BLACK SABBATTACK - SAT. JAN. 16TH, @ THE ROCK HOUSE, LONG BEACH 10ish. Unleashing a Classic set of 70's era Sabbath ! James Ojeda(vocals) and Don Peterson(bass). doors @7pm. SPECIAL EVENT-ROCK N ROLL ROYALTY in the HOUSE!!!!! 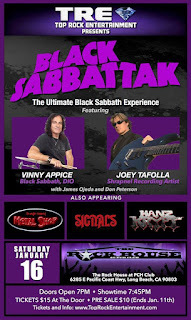 Black Sabbattak , Featuring VINNY APPICE of BLACK SABBATH and DIO on drums and Shrapnel recording Artist Joey Tafolla on guitar!! Also, the hard rock licks n riffs by our own local boys-OC Metal Shop, A Tribute to the mesmerizing tunes of Rush by SIGNALS and closing the night with a doom and gloom sound is Hanz Krypt. So, if you are a fan of Black Sabbath, Dio or just a rocker at heart, this is a show NOT TO BE MISSED!!! Pre Sale $10-ends Jan 11th at 3p/At Door $15. Buy your tickets TODAY before we SELL OUT!!! Doors 7p/Showtime 8p/Seating 1st come, 1st served. Restaurant open till 930p/Billiards/Smoking Patio/Free Parking. DISCOUNT Room Reservations by calling 562 596 1631, and ask for the Top Rock Rate at $89.